A very easy to prepare and a very tasty chutney. I had come across this recipe a long time ago but never got a chance to make it. I purchased Thai Guavas and I luckily remembered to give this recipe a try. We loved it. I served it with Set Dosas in addition to Roasted Gram Chutney. I even tried it with some roti and it tasted fantastic. 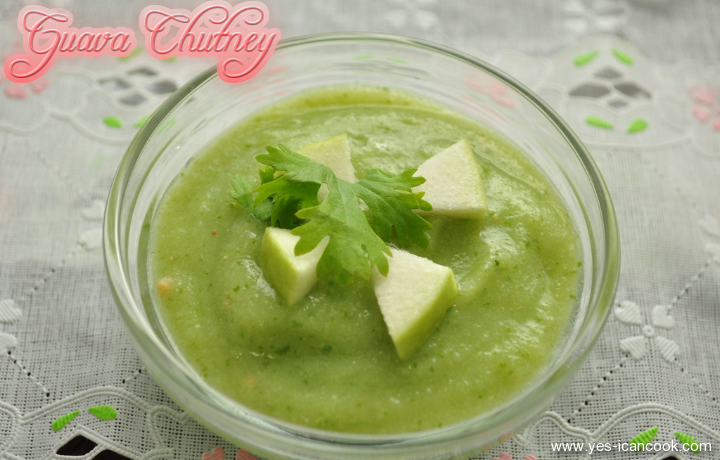 Give this chutney recipe a try the next time you have some guavas that need to be used up and you will thank me. 1. Wash and cut the guava into small pieces. 2. 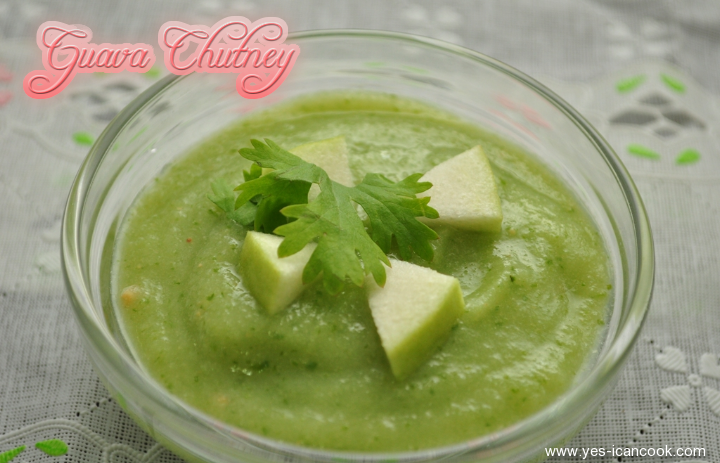 Add the guava pieces, ginger, green chilli, lemon juice, coriander leaves and salt to the jar of a mixer or food processor. 3. Grind it to form a coarse or a smooth chutney. Enjoy Guava Chutney. Yes, that's how simple it is. Recipe adapted from NDTV Cooks. Thanks Resna and you are always welcome. Let me know how you like it if and when you try it. Love Guavas!! Will try this chutney when I get it next time, U dont remove the seeds is it? the ones we get have lots of seeds! Removing seeds would be a personal choice Aara. I did not. Most of them got ground and only a few remained. The Thai Guava has less seeds anyway. Let me know how you like it if and when you try it. Adjust the ingredients as per taste. Delicious guava chutney looks perfect love it. Very interesting chutney..Will get some thai guava to give a try. Sure Priya. Do let me know how you like it if and when you try. Never knew about guava chutney! sounds really interesting. new to me! looks good! we make jam out of guava but never made chutney, thanks for the kind words for my sprouts dish on Pooja's space. love to see you at my space too. never heard of guava chutney. so simple and easy.